The Star Wars Universe has many unique style of ships. One of the most unique is Boba Fett’s ship, which is called Slave 1. Of particular note iit lands in a different direction than it flies. It does not get a lot of screen time during the Star Wars series, but it does play an important role in the film as it is the ship that takes the carbonite frozen Han Solo back to Tatooine. When I notice that LEGO has an Ultimate Collector Series version of this ship I jumped at the chance to own one. This is my review of this iconic set. This set is one of the Ultimate Collector Series, which are the larger sets that LEGO produces. This set, at 1996 pieces is no exception. When built, the model is 7” high, 17” long, and 14” wide. This size puts the ship is at minifig scale, which helps with the sense of play, as well as a more realistic sense of scale. This will come in handy for us toy photographers. Being an Ultimate Collector Series set, it does come with a rather handy stand that can be used for display. The set comes with 4 or 5 minifigures, depending on how you count. Included is a Bespin Guard, a Stormtrooper, a Han Solo, and a Boba Fett. 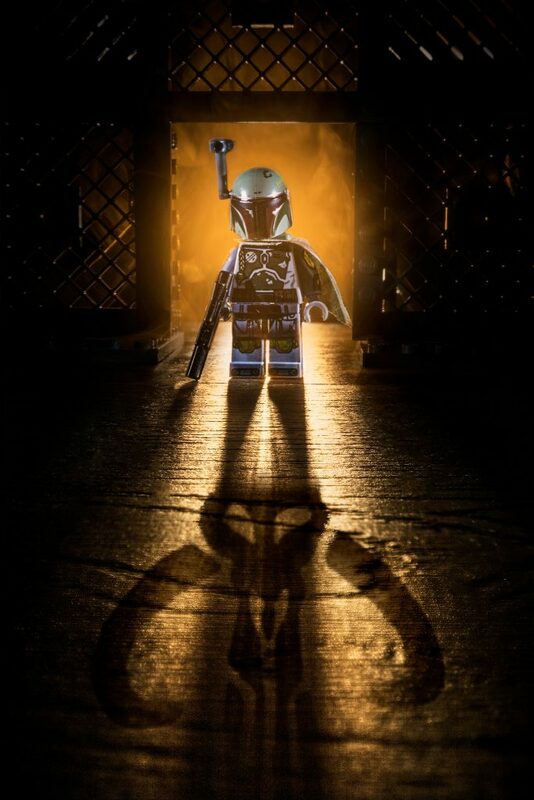 The Boba Fett minifig is more detailed than the version of him that comes in other sets. The Bespin Guard and Han Solo are rather plain looking in comparison, but still perfectly cromulent. 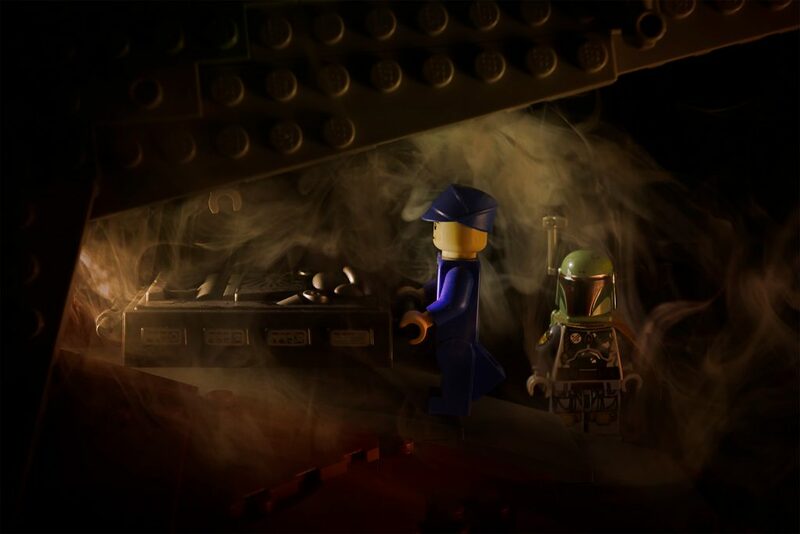 The 5th item that may or may not be counted as a minifig is Han Solo encased in a slab of carbonite. The carbonite slab is hollow at the back, and contains a couple studs that the Han Solo figure can grip with his hands, essentially hiding Han behind the slab. This isn’t over useful for photography, but sort of clever and worth mentioning. If you look at Slave 1 you realize that there isn’t a square angle on the thing. It is bulbous in certain places, and cylindrical in others, but never square. I can only imagine how much trouble this gave the LEGO build engineers as they had to figure out how to recreate this ship. They pulled it off beautifully. 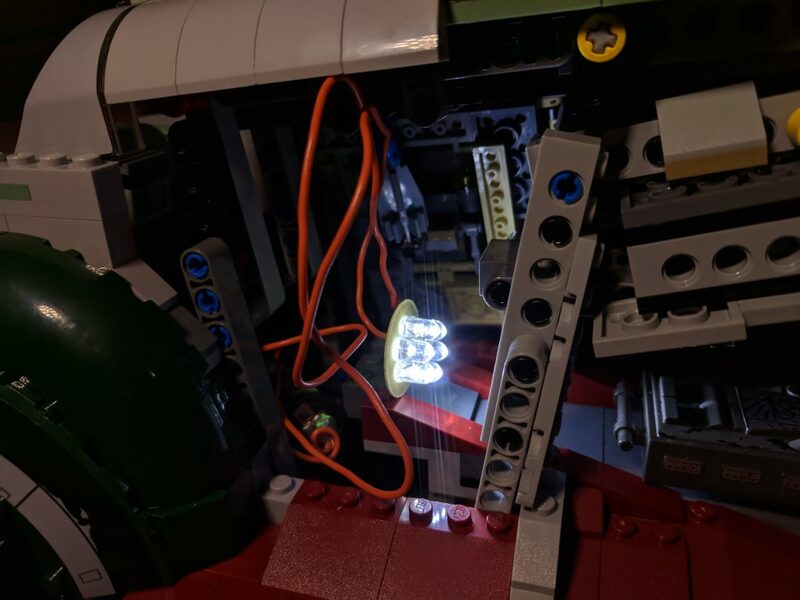 It is a very complicated build, and uses the concept of SNOT (studs not on top) to an degree I have personally never seen. This allows for the complex shapes and structures that make up this ship. There are studs facing almost every direction. The ship itself is very detailed. It sports an expansive cockpit, which swivels to be appropriate for both landing and flight modes. The swivel guns on the tail look very accurate. It sports two hidden compartment on the sides that contain additional weaponry. The tail contains a cargo door that is especially designed to hold the carbonite slab. Unfortunately the base of the ship, while detailed, is not solid. Consequently, it is not overly photogenic from underneath. I don’t think this will cause too many problems in practice. The inside of the ship is fairly hollow. This, combined with the non-solid base, makes it easier to slip small lights inside for that more dramatic photo. The core of the ship is incredibly solid. However there are a lot of decorative bricks that come off fairly easily. For example, while taking the above photo, I had to replace the round bits at the base of the tail several times. As a result, I would be cautious taking this ship out into the field, however in a studio setting this doesn’t seem to cause many issues. 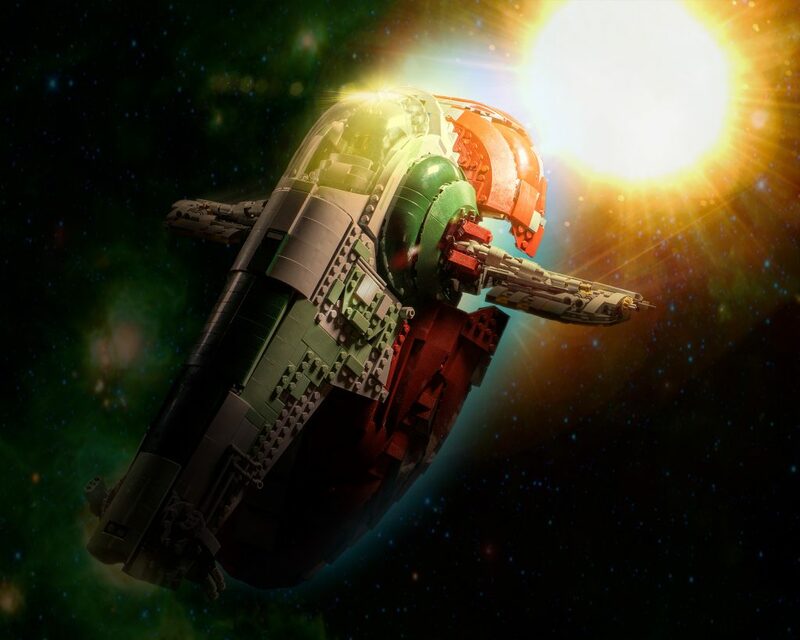 The Slave 1 model is a master class in creating complex shapes with LEGO bricks. It is a true work of art in and of itself, and is therefore worth adding this to your collection for that fact alone. The ship’s detail, relative correct scale, and incredibly rugged build means that it will both look good in photos, as well as on the shelf. I don’t believe this set is a must have for the toy photographer. 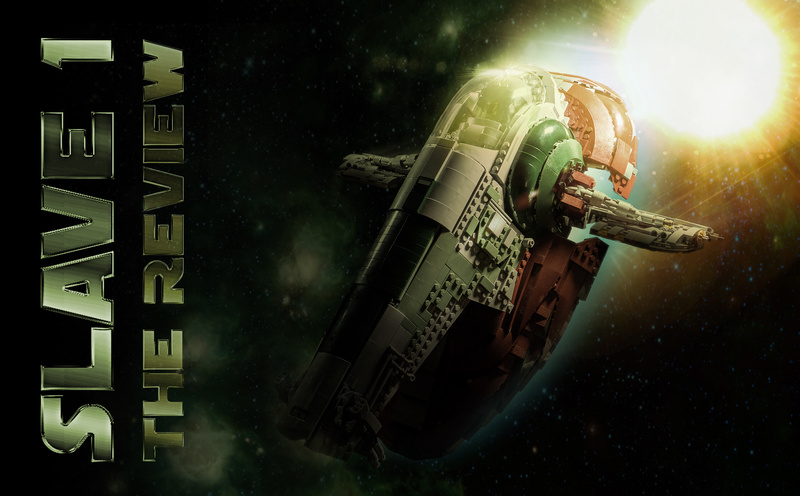 However, if you are looking for an interesting model to add to your collection that is both a challenging build, and will look good in photos, this ship should be high on your list of sets to consider. If you’ve made it this far, come continue the discussion over at our G+ community! And while you’re at it, subscribe to our weekly email round up and our shiny new podcast! Thanks for a great review Dave! 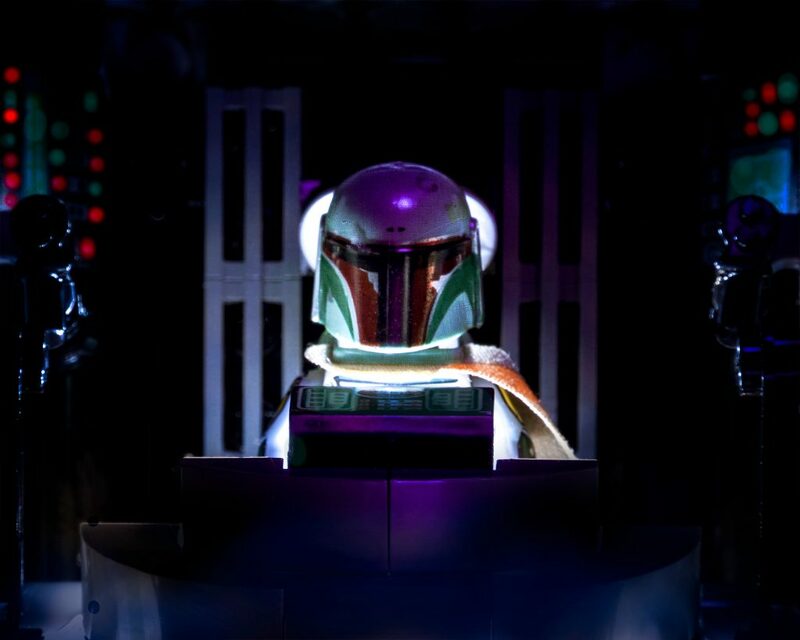 The set does look awesome and I love your photo of the loading of Han! If you ever get a change to see the model in person, I recommend taking the time. This looks like a great build and, as always, you have done justice to the design with your photography. What a great set and review! Well done 👏. I love the backlighting effects – looks great; and the fact that there is room to add them in is definitely attractive. The atmosphere of you loading Han shot is epic!